When it comes to helping a person with disabilities access services that promote a robust quality of life, it generally requires a myriad of agencies and caseworkers. This approach, when not paired with housing, can create an environment that isn’t able to fully address a person’s overall welfare and health. To find a more strategic solution, the Section 811 Project Rental Assistance Program (“811 PRA”), created in 2011, adds the provision of housing to ensure a more complete and balanced bundle of services. According to the U.S. Department of Health and Human Services Office of Disease Prevention and Health Promotion, affordable and stable housing is integral to an overarching strategy to improve health outcomes for people with low incomes. Texas’ 811 PRA Program expands opportunities for hundreds of individuals with disabilities who want to live in the community. For many of these individuals, that opportunity is impeded by many factors including a shortage of affordable, accessible and integrated housing, and a lack of timely and strategic transition of services when a housing option is immediately available. The 811 PRA program pairs participating properties with persons with disabilities looking for housing, as their services “follow” them to that new housing location. The properties involved offer federally-subsidized rental housing units. Eligible 811 program residents pay no more than 30 percent of their income for rent and utilities; the program pays the property to cover the difference between the established rent and what the client can pay. With this assistance, extremely low-income people with disabilities can move into high quality communities, achieve independent living and continue to receive long-term services. One important facet of the program is that it provides a significant savings to tax payers. When an individual moves from a nursing home into the community, there is a significant reduction in Medicaid expenses for services to the person. In state fiscal year 2016, the average cost of providing services to someone on Medicaid and in a nursing facility was $3,820 per month. The average cost of providing long term services and support to someone who is on Medicaid in a community setting was $1,730 per month. With an estimated average 811 rent subsidy per month of $760 to provide the housing, this would average an estimated savings of $1,330 per month. Texas’ first 811 PRA clients are now establishing routines and roots in their new homes and communities, and successfully housed and receiving services. Program administrators for the Texas Department of Housing and Community Affairs (“TDHCA”) and Texas Health and Human Services (“HHS”) continue to bring more properties into the program and enroll more individuals into the program. TDHCA anticipates the transition of 60 new households into the community by year’s end. Currently, about 400 units are available within participating properties located in eight designated metropolitan areas. An estimated 250 additional units will be added to the program this year. The 811 PRA program design is based upon previous successful partnerships between TDHCA and HHS, such as Project Access, which assists low-income non-elderly persons with disabilities to transition out of institutions and back into the community. Households transitioning out of institutions are often assisted by the Money Follows the Person Demonstration Grant (“MFPD”) funds, which enable TDHCA to issue those households Section 8 Tenant Based vouchers. TDHCA and HHS work in partnership with eligible multifamily properties, and local disability service organizations to place eligible clients. Section 811 PRA local partners include Referral Agents, funded through HHS, who work directly with people with disabilities in need of permanent supportive housing; 811 Service Coordinators who organize services for individuals once they have moved into a Section 811-supported home; and developers using public sources of development capital to build or rehabilitate affordable multifamily housing in Texas. “Our local partners are critical to the referral process, which allows for specific solutions to overcome individualized challenges for each participant,” explains Spencer Duran, TDHCA Section 811 manager. Property developers are required to include units for 811 PRA program use when applying for federal tax credits and other funding through TDHCA. Federal tax credits administered by TDHCA are the largest generator of reduced rent properties in Texas. HHS provides training through regularly-scheduled conference calls and in-person training with relocation contractors, Local Mental Health Authorities, and managed care organizations that employ service coordinators. “Affordable, accessible and community-integrated housing is a critical factor in helping older adults and persons with disabilities maintain their health. Housing is a social determinant of health, and improving access is a key strategy to improving the health of the people we serve,” says Elizabeth Jones, Money Follows the Person Director for HHS. Sedric B. is one of the first participants who chose to apply to the 811 PRA Program. Thanks to 811 PRA, he recently moved from a nursing facility into his very own apartment. Sedric had worked in the music industry and for AT&T. He later started doing stand-up comedy in Chicago before moving to Texas more than four years ago. 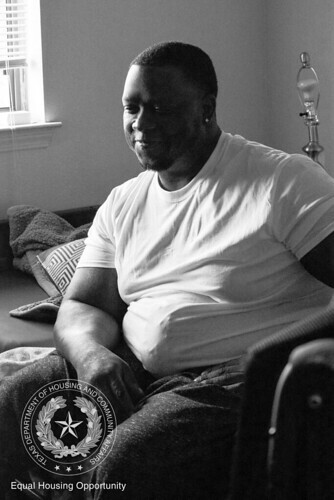 After making Texas his home, 37-year old Sedric experienced medical issues that landed him in the hospital and then a nursing home. "I never thought about being in a nursing home," he said. Owned by DMA Properties, LLC., and originally financed in part by Texas’ Low Income Housing Tax Credit Program, Prairie Commons Apartments sits in a quiet Dallas community. Property manager LaRonda James works with a small group of 811 PRA tenants, handling unique needs like coordinating rental payments should an 811 PRA participant need extended hospitalization, or be out of their home for a length of time.